There is an inescapable air of frivolity at Ballyvolane - the name itself means ‘the place of springing heifers’ and is testament to the fertility, richness and natural diversity of the land on which the estate lies. Originally built in 1728 by Sir Richard Pyne, a retired Lord Chief Justice of Ireland, Ballyvolane was designed in the classic Georgian country house style with three storeys, as illustrated in the old Estate book opposite. An amorous descendent, Arthur Pyne, acquired sufficient capital from his marriage to three wealthy women to have the house considerably enlarged in the early 19th century. The three-storey house was again modified in 1872 by George Pyne. He had the building pulled apart and then, by removing the top storey, recreated a two-storey house rendered in Italianate style, with an extensive west end wing. Recent research carried out Terence Reeves-Smyth unearthed tender documents for the remodelling of Ballyvolane from this time - the architect was Richard Rolt Brash (1817-1876), a Cork architect, whose father and brother were well known builders in the city. RB Brash is better known as a very active antiquarian and friend of John Windele - he was especially interested in round towers. The rebuilding/remodelling in the early 1870s followed the re-acquisition of the house and demesne by the Pyne family in 1869. Arthur Pyne (1747-1839) who probably built the present house around c1800 and laid out the present parkland (which looks Regency in date), was succeeded by his eldest son Jasper Pyne. Unfortunately, when Jasper died in 1860-1 he left no male heirs and as a result his wife and daughters did not inherit the property (the estate had been left by his father Arthur entailed for a life and could only be inherited by male issue). Consequently, following a big court case in May 1861 the property passed to Jasper’s younger brother, the Rev. William Masters Pyne, Rector of Oxted in Surrey. In March 1864 the Rev Pyne put the place on the market through the Encumbered Estates Courts. It remained on the market until bought by another member of the Pyne family in January 1869. 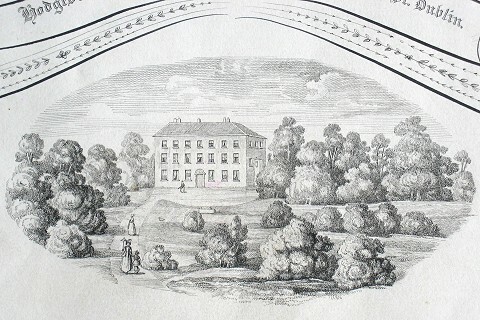 It appears that Ballyvolane was originally purchased by Sir Richard Pyne in 1702-3 for £696; prior to this it had been the property of Sir Richard Nagle and Edmond Barry, but had been granted (forfeited lands) to Viscount Sidney. At the same time Sir Richard Pyne also purchased three other Co Cork properties from the Commissioners for Sale of Forfeited Estates; one was Blarney, the others were the estates of Ballinaneala and Ardra. He also in England bought Great Codham Hall in Essex, where the family continued to live well into the 19th century. A few years after the original house was built by Sir Richard in the early 18th century, the intriguing drama of a well known local legend was to unfold, revealing the mysteries of some long lost buried treasure - see below! (Taken from the book ‘Curious Tales from North Cork’ by Edward Garner). To the east of nearby Castlelyons there is a cross-roads known as the Hag’s Cross, reputedly the scene of the last witch burning in Ireland. Since the presumed witch was a Joan Condon who died in 1731, then she could not have been the last. Over thirty years later an Alice Moran was incinerated in Limerick having been found guilty of poisoning one Joan Sullivan. Nevertheless, Joan Condon’s story remains an interesting example of fact and superstition becoming intertwined. Nearer to Castlelyons stands Ballyvolane House, reached from the road by a winding drive affording lovely views of North Cork countryside on one side and bounded by a tree shaded shrubbery on the other. Nowadays, Ballyvolane is a pleasant single storey house, but in the eighteenth century there was an additional floor. Living there in 1730, having rented the house from the Pyne family, was the elderly Andrew St Leger and his wife, Jane. Like others of the ilk, the St Legers were in the habit of keeping most of their valuables in a chest stored in the principal bedroom. 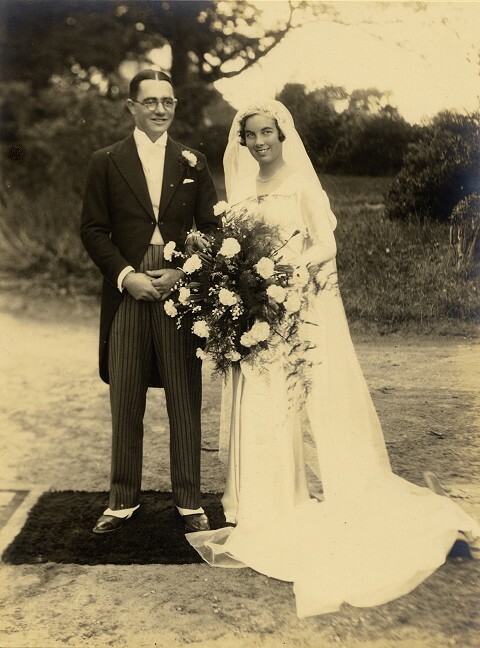 That trunk, the contents of which could mean an easier life for some, became the focus of attention of the butler, Timothy Croneen, and a maid, Joan Condon. The pair decided to murder the St Legers. One dark November night the two crept into the principal bedroom and while Joan Condon held a lighted candle, Croneen plunged the knife into the throats of the sleeping couple. Grabbing the chest of valuables, the killers hurried from the house and buried it within the shrubbery. Then they returned, for their plan was to let it be assumed that the murders and robbery had been committed by strangers. And their plan at first looked like being successful. Next day with the grim discovery of the blood soaked bodies a considerable cry was raised throughout North Cork and beyond. No suspicion attached itself to either the butler or the maid. However, matters started to go wrong on the day of the funeral. In those days it was custom for servants to ride on the carriage bearing the coffin of their deceased master or mistress, and so it was that Croneen and Condon joined the other Ballyvolane servants as the cortege left a day or so later for the churchyard at Aghern. A short distance behind the funeral carriage trotted Jane St Leger’s pet, which whined miserably in the wake of its dead mistress. Joan Condon’s nerves began to tighten as she watched the little animal. Croneen, noticing her mounting distress, slipped from the carriage and seized the dog. Once the procession had passed from view he brutally slit the dog’s throat and hurled the body over a convenient ditch. To this day the spot is known as The Spaniel’s Cross. Croneen caught up with the cortege and resumed his seat beside his accomplice. Curious to the spaniel’s disappearance, the other servants began to watch the butler and the maid with mounting interest, prompted by some unspoken suspicion. Eventually a ford was reached, but the horses pulling the carriage simply refuses to cross despite strenuous efforts by the drivers. Someone put a voice to suspicion by remarking that witches could not cross water. Joan Condon felt terror rising in her mind. Croneen, too, was more than a little troubled by the way matters were going. With much difficulty and frantic blows the horses were eventually persuaded to ford the stream; there were no further incidents. Ballyvolane House, an Irish Georgian Country House photographed in the fities, now a historic Cork Inn offering luxury country house accommodation in CorkAfter the funeral the servant’s suspicions about Croneen and Condon began to Harden. No so quiet murmurings began to take bolder tones; some muttered the authorities might be well advised to look no further than Ballyvolane House itself for the killers of the St Legers. The same night Croneen and Condon, thoroughly frightened, decided to flee. Without waiting to dig up the chest in the shrubbery the pair made their way to the Cove of Cork. Once more the element of water entered the story. The murderers managed to secure berths on a vessel bound for France and thought themselves safe. Gathering fate moved when unexpectedly a storm blew up, denying the ship passage from the harbour. After unsuccessful attempts to reach open sea, the Captain decided to return to harbour and try again the next day. A decision that proved too much for the fugitives. Down the ships’ gangplank they scuttled and somehow managed to avoid capture as they made their way across country to finally reach the port of Limerick. It was there their luck finally ran out, being recognised by an observant official as the pair from Ballyvolane being hunted by everyone, and arrested them. Both were found guilty at their subsequent trial in Cork. Croneen was executed and a little later so was Condon. She was sent to a place not far removed from the scene of the killings and, being thought a witch, was secured to a stake and burned to death. Where she perished was later named The Hag’s Cross and is still marked as such on some maps. A few records have survived about the double killing of Andrew and Jane St Leger at Ballyvolane House. None contain any reference to witchcraft or to Joan Condon being a witch. What has almost certainly happened is that the murders and some quite separate episode involving the burning of a witch have become inextricably intertwined. “Offering for a reward for apprehending Teige alias Timothy Croneen, for the murder of Andrew St Leger, late of Ballyvolane in the County of Cork and Jane St Leger his wife, and for the robbery of the said Andrew St Leger”. Not mentioned in the description of the crime were Joan Condon or the unknown Gardener. The proclamation was posted all over Munster and Croneen’s capture was inevitable, taking place at Limerick where he was spotted trying to board a vessel by a vigilant customs officer. 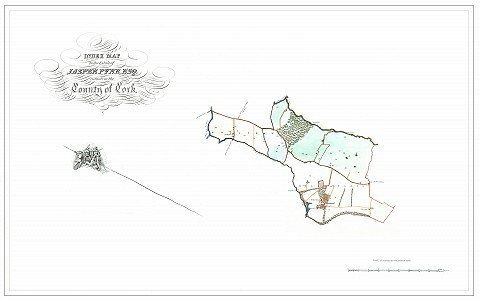 Croneen was taken to Cork where he was tried in January 1731. By his side stood Joan Condon. In those times the slaying of a master or mistress by a servant was regarded as petty treason and as such the charge was not heard by a criminal court but placed before a special commission. Sitting on this commission were James, Earl of Barrymore, Matthew Dea, the Hon James O’Brien, Henry Boyle, Robert Jocelyn, Anthony Jephson, Redmond Barry, William Maynard, Edward Corkery, Hugh Dickson, Noblet Dinscome, Stephen Moore and Bart Purdon. Prosecuting was the attorney General for Ireland. Both accused were found guilty on January 15. Officials hurried Croneen out of the court and bundled him into an awaiting dung cart which hurried him off to Gallows Green where he suffered death by hanging, drawing and quartering. Later his head was spiked on the wall of the city gaol as a grim warning to others. A few days later Joan Condon died at Gallows Green, but whether or not by the same ghastly method is not recorded. Today Ballyvolane House retains one tangible evidence of the murder of the elderly St Legers. When the house was being renovated in the last century, and reduced by a storey, bloodstained floorboards were discovered in the principal bedroom and it has proved impossible to remove them. Whether or nor Croneen and Joan Condon buried the St Leger valuables is questionable. However, Ballyvolane can boast possibly the best dug over shrubbery in Ireland, the result of numerous searches over the years for the treasure chest. All that has been turned up so far have been the rusting tools discarded by disappointed searchers.